On Thursday, the Government of Saskatchewan gave $297,702 to the Regina Open Door Society's Newcomer Welcome Centre. The centre opened in 2009 and serves immigrants and refugees who are permanent residents as well as temporary foreign workers and international students. In the last six years, more than 10,000 clients have used the centre while they transitioned into schools, the community and the job market. The Regina Open Door society usually welcomes about 15 refugees each month. Last month they saw the arrival of 50 newcomers. That's 50 people requiring temporary accommodation, orientation and to be connected with a local host/mentor. 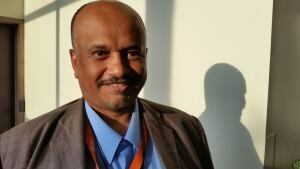 Getachew Woldeyesus is a manager with the Regina Open Door Society. He said the bulk of the newcomers are from Burundi, the Democratic Republic of Congo and Syria. "We make sure everything is in place for them when they arrive," said Woldeyesus. New refugees have temporary accommodation for about a week until they can be moved into permanent homes. Woldeyesus said an increasing vacancy rate has not translated into affordability. Woldeysus said the Open Door Society is looking for landlords who want to partner with the organization and help house new arrivals. In addition to finding housing, settlement workers take newcomers shopping, take them to medical appointments and teach basic life skills such as how to use laundry machines and stoves safely. More than half of the new refugees who came in March are children. Settlement workers get them enrolled in schools and their parents enrolled in English classes. Woldeyesus said the organization needs volunteer mentors. Volunteers are required to meet with a newcomer frequently over the course of a year and introduce them to life in Canada. It's a relationship that Woldeyesus said goes both ways. "I've had mentors tell me their life has changed as a result of meeting the people. They learn new cultures and they say it's opened their eyes. The teaching and sharing turns into a lifetime friendship." Safwan Zanoun came to Regina as a refugee thirteen years ago. His family fled the war in Iraq and had been living as what he describes as "second class citizens" in neighbouring Syria. When he arrived, the Regina Open Door society helped his family find a place and connected them with a volunteer mentor. Zanoun said that relationship was very important to him. "It's actually for one year and then the year finished, and he said guys I will still be able to help you. That was 13 years ago and we are still friends until now." Zanoun started English classes through the Open Door Society. After five months he was able to find a job at a gas station. That job led to a job at a hotel, then as a dental technician. Once he had a steady job Zanoun turned his attention to finding a wife. The conflict in Iraq had settled down long enough for his father to go back to visit family and friends. He was chatting with his father on the Internet when he saw a woman walk past the camera. "Rahma she just passed. After that I started asking about her and asked my parents to get engaged with her." Rahma Zanoun giggled when she talked about the first time she saw a picture of the man who would be her husband. The would-be bride was nervous about starting a new life in Canada with a man she had never met in person. "I was scared in the beginning, but the Canadian people are so friendly," said Zanoun. Rahma spoke no English when she arrived, but the couple married and were able to build a life together. 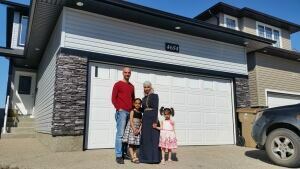 They have three daughters and have moved into a bigger home in Harbour Landing. Rahma found a job at the nearby Wal-Mart as a cashier. When her husband comes home from work he takes care of the girls and she goes to work. "I love it because I practice the English," said Rahma Zanoun. Her workplace is filled with new immigrants and Zanoun said she enjoys being able to help people in the same way she was helped. "I know the feeling because when I came to Canada I needed help sometimes." Zanoun takes people to appointments, introduces them to Canadians and shows them around the city.